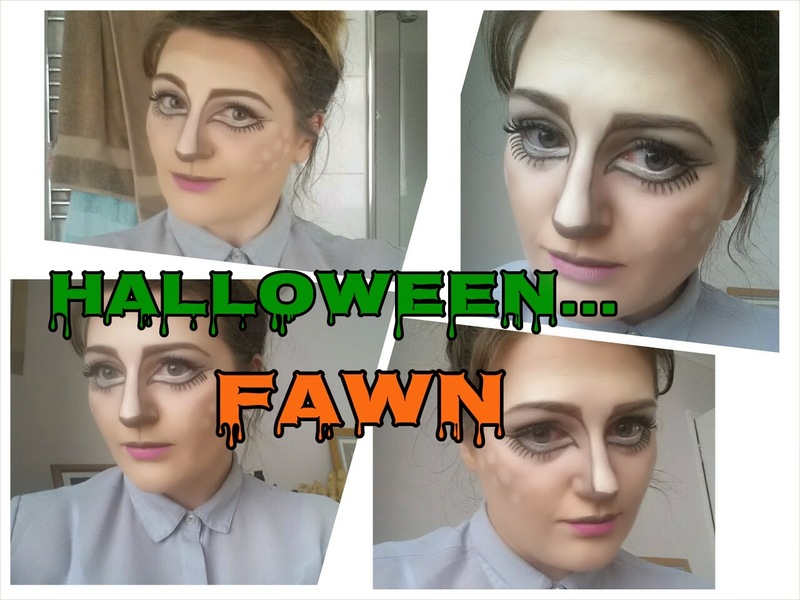 I know, I know you have probably been inundated with videos and posts on this Halloween look, but I thought, it was super cute and didn't take that much time at all. It is great for a quick get ready and look that doesn't look creepy so you can go for that cute innocent look. Before I filmed this tutorial, I did my usual face makeup (minus the contour and highlight) and filled in my brows. Taking a dark brown liner (MAC Duck), I drew a contour line down either side of my nose, and creating a small deer shaped nose at the end. Following the contour line up, I connected it into my brows to create a deer shaped face. Taking a white kohl liner (MUA Snow White), fill in the bridge of the nose and lightly blend out. taking the liner apply it to the lower forehead and under the eyes and cheeks, again lightly blend out. Taking the dark brown kohl liner, create a bottom water line on the eye and line the top lid. Then lightly line the brown liner with black gel liner (Maybelline) to help put more impact on the eyes. Taking a light brown eye shadow, lightly contour the sides of the nose more, and add this shadow to the crease. Taking a more orange toned bronzer, contour around the forehead and apply to the cheek bones, this helps complete the color of the fawn makeup. Taking the white liner apply a thick layer in the space between the liner and under the eye, and apply a few large white dots to the cheek bones, creating the doe eyed look and fawn fur appearance. Finally to complete the look just add some false lashes to the top lash line and the bottom line we created before. You can pair this look with a tan dress or shirt or even go for a fawn/deer onesie if you wish. If you don't want to buy some antlers, you can makes some with your hair or twigs from the garden, though fawns don't have antlers so you can go without. But, be creative and I can't wait to see your looks.